Root rot happens when a plants roots are attacked by micro organisms such as bacteria and fungi. The most common cause of root rot is overwatering. Severe root rot can kill a plant. Salt burn is caused by excess salts in the soil. The best way to prevent salt burn in Phoenix soils is to deep soak the soil. 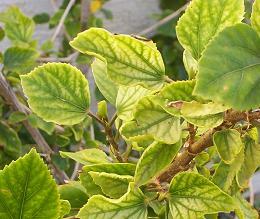 Early evidence of salt burn is leaf curl, followed by the perimeter of leaves everywhere on the plant turning brown and drying out. The drying/burning will start at the tip and procede along the edges to the base. 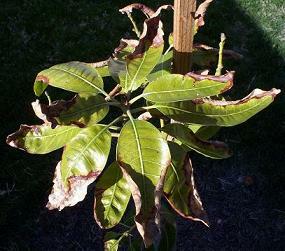 Severely burned leaves will fall off. Many plants can withstand salty soil and persist for years while other plants will sicken and eventually die. Excess fertilizer adds salt to the soil, so one should be very careful when fertilizing salt sensitive plants. Below is a listing of particularly salt sensitive exotic plants.